Here’s a neat fact to start your day: Copyblogger has a goat keeper among its readers. We know because he took our 2015 Cost of Online Business survey. Now, more than likely it’s a prank. A prank by some misfit in Boca Raton. But I have to confess: part of me wants there to be a goat keeper (somewhere exotic) who is a faithful reader of Copyblogger. An enterprising shepherd who dreams of growing his herd — with content marketing. But whether or not the goat keeper is real doesn’t really matter. It is, however, just one of dozens of interesting discoveries we made during our 2015 Cost of Online Business survey. More than a quarter of respondents identified as a Small Business Owner. Most website owners are struggling to make a living online. Yet more and more people are choosing to enter the online business realm. Generating traffic is the biggest challenge of running an online business. And 53 additional interesting results. Results that will help us create content that solves your online business problems and develop new products that better serve your needs. Not to mention allowing us to upgrade our current products based on what matters most to you. Naturally, we wanted this information to serve you better. But we thought you needed it, too. How can you accurately evaluate your current strategies and tactics — and their associated costs — if you don’t know what other folks are doing and what’s working for them? You need to know your options. We’ve decided to provide the results from the survey in multiple formats. First, in the superb infographic below designed by our very own Lauren Mancke. 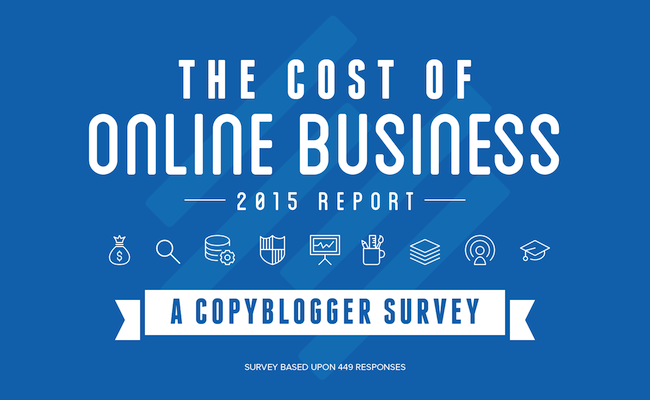 This infographic touches upon the highlights from the 2015 Cost of Online Business survey. At a quick glance you can see the state of the cost of doing business online. Second, you can listen to a short episode of The Lede where Jerod and I talk about the methodology behind the survey, results that stood out, and lessons learned (one really big one for me). Finally, you can dig a little deeper (which we highly recommend you do) by grabbing our free 58-page ebook, The 2015 Cost of Online Business Report, at the end of this post. The report has all the results from the 57-question survey, plus analysis and commentary by Jerod and me. As you work through all this material, it’s possible you’ll see many opportunities you or your business can take advantage of. And that was the ultimate goal of this survey and report: to give you information that will make you a more informed and savvy online business owner. So, enjoy! Here’s to making 2015 the best year you’ve had yet. And don’t forget to grab your free copy of the 58-page 2015 Cost of Online Business Report below.